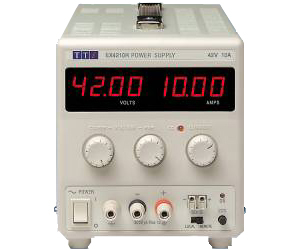 The EX4210R is a high current single output bench power supply in a compact case style capable of providng 420 watts of power. It can provide current of up to 10 amps at voltages up to 42V in both constant voltage and constant current modes. The choice of 42 volts enables it to be used as a a test source for the new generation of automotive electrical parts which will use 42V (18 cell batteries) instead of 14V (6 cell batteries) thus reducing currents and hence wiring losses.